"Go to the ant," is the instruction. But when ants are crowded, they cannot get around their trails so easily. Without external control on the Lasius niger colony, crowding could easily lower the efficiency of working of the whole colony. In this series of experiments, Tomer J. Czaczkes, Christoph Gruter and Francis L. W. Ratnieks found that crowding reduced pheromone deposition by workers. They publish their paper today in the Journal of the Royal Society Interface. The ants' trail pheromones are normally deposited regularly on trails, but when experimentation reduced "crowding" artificially, their deposition reduced by a factor of 5 or 6. While humans and other species coordinate their individuals with top-down instruction, complex control mechanisms can be necessary in routing procedures For example the "dynamic task allocation" you can hear about in a factory or similar institution. Insects are expert, on the other hand, in using bottom-up mechanisms like these in order to regulate collective behaviour. The black garden ant in the grounds of the University of Sussex is a common but useful member of the community. Collected in the University grounds, plastic 40x30x20cm plastic boxes housed the foraging activity of 500-1000 workers with no queen involved. Some brood encouraged normal behaviours in Plaster-of Paris nests, forming living quarters within the plastic boxes. As there were no complaints, we assume the ants were comfortable with the accommodation, all meals provided (with experiments). Black glass beads were used to simulate crowding within the artificial nest set-up. Coated with the smell of nest-mates, each bead was placed 2cm from the next on the 20cm walkway used for reaching the foraging area. Here we can see exactly where two ants are encountering the black (in this case) beads. The foraging ants deposited less pheromone on crowded trails. Checking how often they collide or make contact with nest-mates, they compensate for this nuisance by reducing it. Nest-mates are detected by both colour and smell, as shown by the black beads. Unfortunately, with many ants on the trail, the pheromone depositions are still higher than with few ants. The importance of a nil deposition when crowding was at its peak can be seen. No more foragers were to be recruited, so unnecessary energy expenditure was reduced. 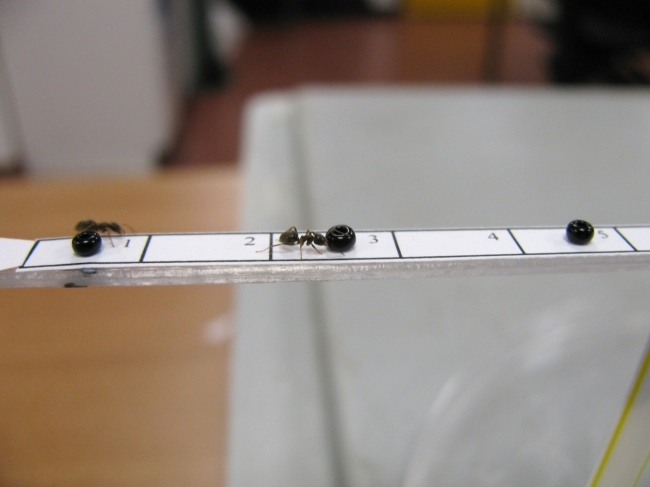 A wider range of timescales could be used by the ants by monitoring trail use by nest- mates and using home-range markings. Such complicated social insect foraging, using feedback loops, shows both passive and active processes working to adapt the colony to successful integration with their food sources. We hope the ants enjoyed their stay!